On the Hawaiian island Maui, more rain falls on the northern slopes than the southern slopes, producing a dramatic difference in forest types on the island’s flanks. The drier, southern slopes are home to forests that are often dominated by a tree known to locals as the wiliwili tree, and scientifically known as Erythrina sandwicensis. In recent years, scientists have been monitoring and trying to combat the spread of a non-native wasp on Maui that lays its eggs on the leaves of many kinds of Erythrina trees, eventually killing them as the leaves become so deformed they can no longer function. 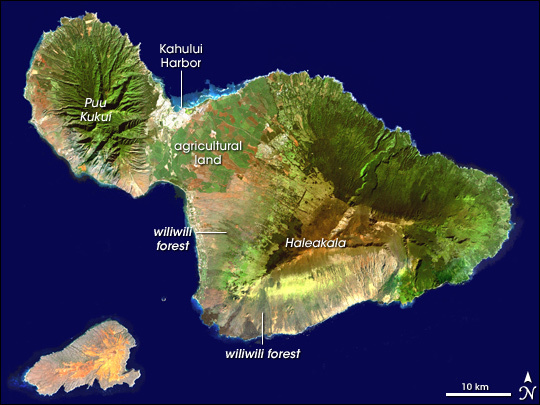 This Landsat satellite image of the island shows the location of the wiliwili forests on Maui. The lush forests of the rainier slopes of Maui appear in bright green in this image, while patches of drier wiliwili forests on the southern slopes appear grayish-green. Maui’s densely populated harbor area appears as a white patch in the northern part of the neck connecting the island’s two lobes. Wiliwili are not only a keystone species in the ecosystem but have been long valued by Hawaiian communities for their flowers, seeds, and wood. To help stop the wasp from destroying Hawaii’s treasured native forest, scientists are currently testing insecticides on the wasp, and they are investigating biological agents that appear to control the wasp in Africa. The Science Bulletins Website of the American Museum of Natural History provides more information on the status of the Erythrina gall wasp on Maui. 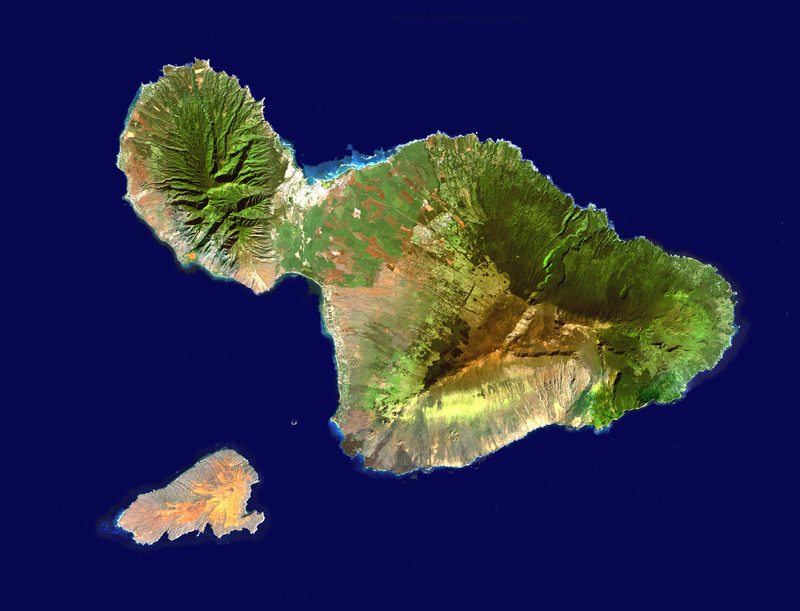 Landsat image by the American Museum of Natural History (AMNH), based on data from the USGS Hawaii Data Clearinghouse. Caption information provided by AMNH Science Bulletins.